We invite you to inspect this property and attend the auction prepared to purchase. TRACT #1: Building site of 10 acres +/-, located in NW1/4-NW1/4 except Lot H-1 therein Section 28-113N-R48 West 5th principal Meridian, Deuel County, SD. Intersection of 480th Avenue and Highway 28. This 10 acre +/- property offers an excellent location to build a residence. Located 2 miles East of Toronto, SD on Highway 28. Great access to larger communities with employment opportunities, good schools, shopping, and recreation, yet, providing all the amenities of country living. Property has established trees to the North, barn, small shed, electricity and is served by Rural Water. AgriData.com indicates this is a primarily grassland area with a productivity index of 52.2. Anyone thinking of country living with excellent location needs to inspect this property. If tracts sold individually, owner will provide survey. 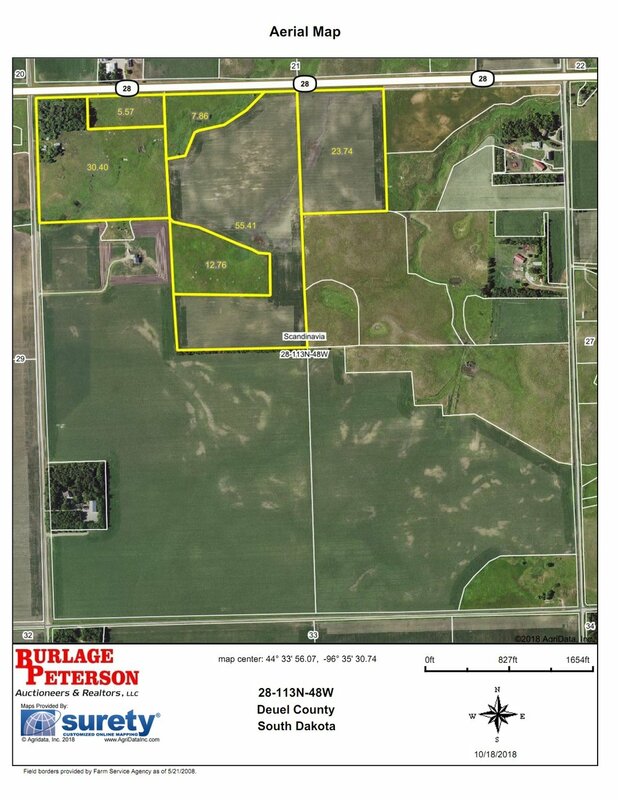 TRACT #2: 126.74 acres +/- of crop and grassland, located in N1/2 of the NE1/4 less the East 55 acres and the E1/2 of the NW1/4, less H-1 of Section 28, T113N, R48W, and including remaining portion of NW1/4-NW1/4 except Lot H-1. This property consists of 85.72 acres cropland with balance well fenced grassland. This is contiguous to Tract 1 and thus has the amenities of electricity and rural water near by. Soils are predominately Barnes-Buse-Svea loams. AgriData.com shows a 67.4 average productivity index. This property is located on hard surface road, (SD Highway 28), only 2 miles from elevator facilities for crop marketing and crop input supplies. Very desirable addition to the existing operation or, as an investment opportunity in a very progressive community. TRACT #3: Tracts 1 and 2 offered as a unit. to provide correct descriptions and information, but is not guaranteed. Announcements day of auction take precedence. Auctioneers/Realtors are agents of the Sellers in this transaction. Not responsible for accidents. This property is sold subject to the confirmation of the Owners.